Newly released data from air monitors on Chicago’s Southeast Side shows higher levels of manganese than previously recorded, prompting renewed calls for a ban of the toxic metal, which can cause nervous system damage at high exposures. The monitors went up in late February at S.H. 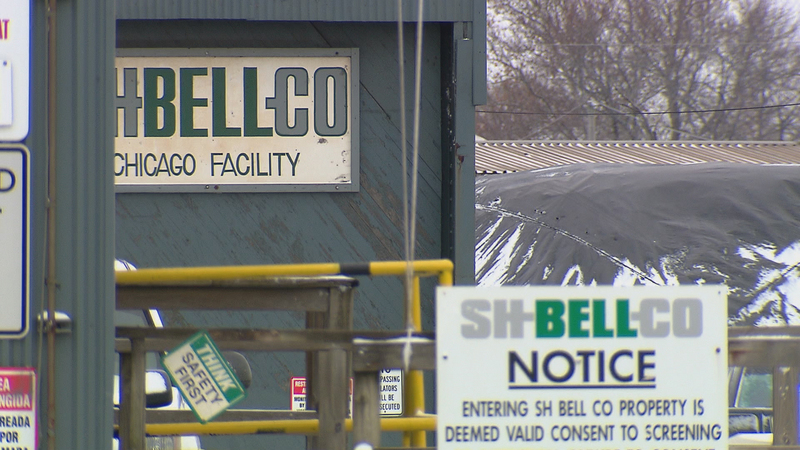 Bell Co., a bulk storage company along the Calumet River that had fought with the Environmental Protection Agency for three years over requirements that it install air monitors because of previous violations under the Clean Air Act. Data collected from the monitors in March and April and published by the EPA show average levels of manganese dust higher than averages recorded in 2014-15 at two nearby sites. The new data represent monthly averages, while the previous averages were calculated for periods ranging between seven and 12 months. The findings from 2014-15 were published last August in a federal health study that triggered the Chicago Department of Public Health’s ongoing investigation into manganese dust on the Southeast Side. In light of the new data, environmental advocates say the city should prohibit companies located near residential areas from storing or handling manganese, a metal used in steelmaking that can cause brain damage at high concentrations, according to the EPA. Two Southeast Side advocacy groups have also called on the city to ban materials containing manganese in residential areas. The levels measured both in the past and this spring at S.H. Bell, however, are within the limit now used by the EPA to determine health risks. Average manganese concentrations were 0.21 micrograms per cubic meter in March and 0.23 micrograms per cubic meter in April. Since 2014, the EPA has used a limit of 0.3 micrograms per cubic meter for manganese, which is more lenient than the agency’s previous threshold. The issue of manganese exposure near S.H. Bell came to light last summer in a health study published by the federal Agency for Toxic Substances and Disease Registry, which was looking to measure the health impact of windblown petcoke dust from KCXB Terminals, located across the Calumet River from S.H. Bell. In response to the study, and following reports concerning manganese emissions by Chicago Tonight and other media outlets, CDPH Commissioner Julie Morita said in March that her department would investigate manganese sources in the area. Now, officials from CDPH and S.H. Bell say it will take a year’s worth of data from the on-site monitors to determine whether a health risk exists for nearby residents. But Geertsma disagrees. “I think you can conclude well in advance of a year’s worth of data whether there’s a health risk,” she said. NRDC’s concerns are heightened because of ongoing research indicating that current federal limits for manganese exposure might be too lenient to protect the public. In March, one of the world’s leading experts on the health effects from manganese – neurologist Brad Racette of Washington University’s School of Medicine in St. Louis – told Chicago Tonight that there is a “strong argument” that existing limits are not protecting people who are exposed to the metal. Geertsma said current standards are based on studies that examined smaller particles of manganese that are inhaled into the lungs before passing into the bloodstream and then into the brain. But new research suggests that exposure to manganese poses a more serious threat, she said. The EPA says risk of manganese exposure is even greater for children. According to the agency, nearly 20,000 people – including more than 6,000 children – live within 1 mile of S.H. Bell in the predominantly minority, low-income neighborhoods of East Side and South Deering. Tenth Ward Alderwoman Susan Sadlowski Garza said she shares NRDC’s concerns about the risks associated with manganese exposure. But she emphasized that measurements from the S.H. Bell monitors are lower than federal risk levels for manganese. Chicago Public Health Commissioner Julie Morita said in March that her department would investigate manganese sources on the Southeast Side. Last week, community advocates sent a third letter to Mayor Rahm Emanuel requesting that he and Morita hold a meeting with residents on the Southeast Side to address health concerns over manganese. The letter, signed by representatives from NRDC, the Illinois chapter of National Nurses United and two local advocacy groups – Southeast Environmental Task Force and Southeast Side Coalition to Ban Petcoke – asks the city to schedule a meeting with residents by July 31. In a statement provided to Chicago Tonight, CDPH said it has raised concerns with S.H. Bell about its handling of manganese, including the company's storage of materials containing manganese, roadway cleaning, loading/unloading and the facility's plan to respond to high wind events that increase dust emissions. CDPH also said S.H. Bell's current plan to control dust emissions fails to meet the city's regulatory requirements. CDPH rejected a previous version of the company's dust control plan in March. "The results to-date indicate monthly manganese and dust levels are below the National Ambient Air Quality Standard and below the EPA’s inhalation risk-based screening levels. CDPH will continue to analyze the data for any spikes or trends. Furthermore, CDPH continues to investigate potential sources of manganese in the area beyond the S.H. Bell Chicago facility." The EPA has yet to provide responses to questions posed by Chicago Tonight for this story. S.H. Bell maintains it is not the only company emitting manganese in the area. The company sent Chicago Tonight a list of 26 companies within 3 miles of its Chicago facility that have documented manganese emissions, based on EPA records. In April, Chicago Tonight reported that the EPA had detected notable levels of manganese emissions at a facility 3 miles south of S.H. Bell formerly operated by energy giant Kinder Morgan. S.H. Bell said it has invested $1.2 million in dust control measures at its Chicago facility since 2014. The company said it is also spending an additional $650,000 on two baghouses, which are used to collect dust. “There’s just zero evidence that S.H. Bell’s emissions are producing airborne manganese dust particles that would produce any threat,” said Sharrow Thompson, the company’s legal counsel. But Geertsma said given the most recent data, S.H. Bell is at least partly responsible. “We know the company has been pointing a finger at other neighbors, but I think there is evidence they are causing a problem, too,” she said. Geertsma said the situation is unlikely to be resolved without further action from the city and other regulators. Note: This story has been updated with responses from Chicago's Department of Public Health. April 3: A newly released report shows additional sources of manganese dust on Chicago’s Southeast Side, where residents were already dealing with exposure to manganese and other pollutants. March 16: Chicago’s top public health official said her department will examine an area on the city’s Southeast Side that faces exposure to manganese dust. March 9: Federal limits for exposure to manganese might not be adequate to protect public health, says a Washington University neurologist.